Here are 50 packable lunch ideas that are quick, easy and healthy! Perfect for kids and adults if you’re tired of packing the same thing every day! I think a lot of people feel like they have to make their packed lunch with one big dish and some sides. I rarely do this. I generally pack 3-4 smaller things so I can enjoy a little bit of a lot of things. More fun to eat that way! Another thing I’ve noticed about packing my lunch is that I’m eating a lot more vegetables during the day than I was when I was eating at home. When I had the whole fridge and pantry to choose from, I typically avoided veggies and chose other things. Now that I have to eat whatever I bring with me, I just make sure to include veggies in my packable lunch ideas for the week and then I eat them! Simple as that! Ask and you shall receive! 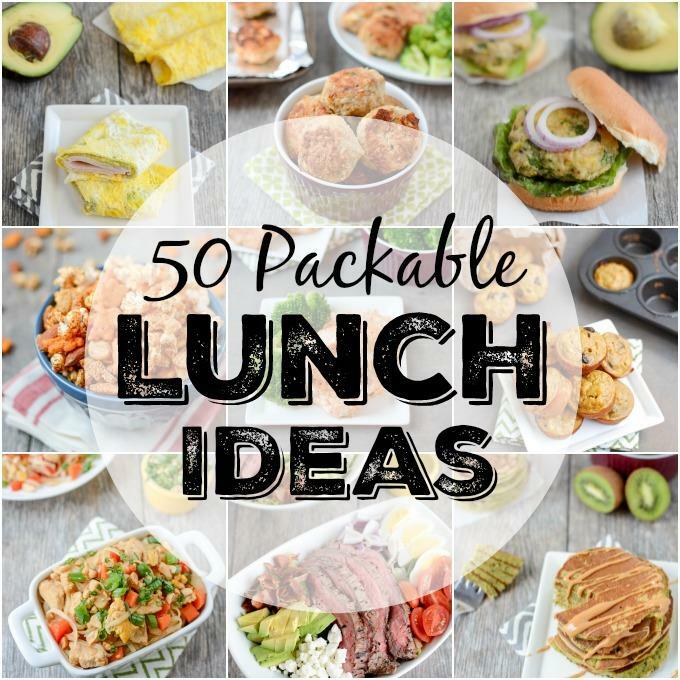 Here are 50 packable lunch ideas to inspire you to pack some fun new lunches! I’ve included links to recipes from the blog if I have them but those are by no means the only recipes you should try! Check out the general ideas and then do your own searches for those types of recipes that fit your taste preferences! Be sure to pin the image below for easy reference later! I’d love to hear your favorite packable lunch ideas! This is awesome. Are you reading my mind? I was literally just thinking when I start working again what a task it will be to come up with lunches! Totally pinning this too! I love seeing your pictures of your lunch. They are always so varied and interesting. And love the idea behind the Saucony app. The rising rates of childhood obesity are scary. I think that the stat that got to me the most was hearing that this generation may be the first with a shorter life expectancy than their parents. Your lunch pictures are all so colourful!! Love it! I always pack my lunch — I enjoy the food much better and I’m way too frugal to use the cafeteria ($1 to make my lunch vs. $6 minimum for lunch there — I’ll choose homemade every time!!). My favourite lunch to pack is either tuna or tillapia with a mix of steamed red cabbage, cauliflower, broccoli, and a bit of sweet potato. With a tonne of snacks, of course — homemade trail mix is my current favourite. Childhood obesity is something I’ve become more and more aware of. I love this app – such an easy way to help the cause to fight the epidemic! I only ever bring lunch! Right now I make an egg white or tuna wrap on Flatout with veggies. Or I use nori wrappers to make “sushi” without the rice or with quinoa instead. These are such great ideas, thank you! I wish I could say I pack my lunch. I do, actually, but I almost ALWAYS decide that I don’t want what I packed and end up buying something. How do you avoid that? oh GIRL I NEEEEEED this right now. Pinning away! Always looking for packable lunch ideas. I pack two lunches each day, mine and Nick’s. These are some WONDERFUL ideas! Nick always gets a PB&J and some type of granola bar, a fruit, and a vegetable. My lunch contains yogurt, my homemade granola, and a few other random things like lentil chips. I’ve also been enjoying your Greek yogurt bars for lunches on my days off. SO DELICIOUS! YES! Packing your lunch doesn’t have to be boring!! My go-to lately has been a HUGE rainbow salad (tons of veggies!) with some type of protein source (this week itz tuna and pinto beans). Today I’m also packing cucumber slices with a laughing cow wedge. I’m the same way as you – I eat way more veggies when I bring my lunch! Love this list! Such a great resource! Pinning now! Umm Saucony this is awesome! Just got new Saucony running shoes as well – never had them for running before and I love them! I always pack my lunch, saves on money, saves on calories and helps me control what I eat. There’s no better way to know what your eating than to prep it yourself! I love these ideas – thanks for posting them!! Packing my lunch always makes me feel 10X better than when I end up eating out, and having a variety of ideas to go to helps break up the monotony. Cool app! I pack my lunch most days, mostly because it’s healthier and I hate spending money on lunch when I know I have ingredients at home. I’ve learned that in NYC, this is definitely against the grain and not normal (many people think I’m crazy for bringing my own). Most times, my lunch is just leftovers from the night before. You always have a knack with knowing EXACTLY what I need all the time. Definitely pinning this one. kids are snackers, so even a lunch of just fresh snacks is better than the “packaged” food. I love the apple rings and pb idea. and the salad in a jar is fun! easy clean up too. Love these ideas for lunch! I always struggle with packed lunch so I end up eating the same thing almost everyday! I need to spice things up a bit! Love this list! Vishnu and I bring lunches from home during the week and sometimes it’s easy to get in to a rut. This list definitely sparked some new ideas! Thanks! Oh my gosh, this is FANTASTIC. I pack my lunch every day, and lately I’ve found myself in a bit of a rut. I think I’m going to try to work my way through this list to keep things interesting over the next 10 weeks. Thank you!! Eating out Monday to Friday can definitely be expensive and hard on the waistline. I aim to bring a lunch 4 days a week and leave one day for lunching with friends or grabbing a slice of pizza/a bowl of froyo. I definitely love it when I have extra leftovers so I can pack something easy for lunch. My other go-to items are salads, homemade veggie burgers that I make in bulk and freeze or chickpea salad sandwiches. Lindsay these are fantastic ideas!!!! Oh my gosh. So many things I could take with me to work! I love it! Is this an iphone only app? Love this!! I swear I am the only one who packs my lunch at the entire hospital! I don’t think I could handle multiple days in a row of eating out! Packed lunches all the way! Thank you thank you thank you! I just started a new semester of college, so I am out and about most of the day! I am so thrilled to have ideas for my packed lunches! lots of great ideas here! i tend to pack snacky lunches (cheese & crackers, tuna & crackers etc.) or big grain-based salads….always a veggie, fruit, & yogurt for sides too! What great ideas! I’ll definitely be putting these to use, thanks! Great post, Lindsay! The statistics for childhood obesity are truly frightening. I’ll definitely be downloading the Saucony app. Love these healthy, packable lunches. Ever notice that healthy food tends to be so photogenic with all its natural color?! love the salads in a jar! I was definitely living on those when I was working like 7 days a week back in june/july. My hospital friends asked me to do a post like this for some healthy/ unrefrigerated lunch ideas. Great post! I typically pack like that although I eat all my snacks abut 2 hours a part. I like to have my bigger lunch at home when I can enjoy it. It’s really an adorable article. I am loving all of your above ideas and I truly like above most of the foods as my lunch item.It’s really more healthy then other foods. I will try to having all the above food as my daily lunch item. Awesome tips! I’ll always try to remember that FAAL acronym for fresh foods, a whole grain, a protein source and lots of vegetables. Lovely ideas and I have to agree that I also eat more veggies when I have a packed lunch than I do when I’m at home. I think at home I go to the fridge when I’m hungry and don’t feel like just eating veggies but if I’ve packed them up earlier in the day I happily eat them and they do fill me up. Such a great resource!! I don’t mind the whole lunch packing thing, but sometimes I find myself making the same things over and over and over so this is a great reference for some inspiration! Great ideas, and a great round up! These look delicious and lovely! I’m about to start my first year of teaching, and I’ve been fretting over preparing healthy lunches and thinking about food prep for each week. This will definitely make that task much easier for me. Thank you for sharing! [WORDPRESS HASHCASH] The comment’s server IP (216.151.210.45) doesn’t match the comment’s URL host IP (72.233.69.6) and so is spam. [WORDPRESS HASHCASH] The comment’s server IP (66.155.8.189) doesn’t match the comment’s URL host IP (66.155.9.238) and so is spam. [WORDPRESS HASHCASH] The comment’s server IP (50.87.144.137) doesn’t match the comment’s URL host IP (198.57.150.101) and so is spam. [WORDPRESS HASHCASH] The comment’s server IP (192.0.80.200) doesn’t match the comment’s URL host IP (66.155.9.238) and so is spam. [WORDPRESS HASHCASH] The comment’s server IP (184.168.193.177) doesn’t match the comment’s URL host IP (184.168.137.128) and so is spam. [WORDPRESS HASHCASH] The comment’s server IP (192.0.81.136) doesn’t match the comment’s URL host IP (192.0.78.12) and so is spam.